Real time challenges and a lot of opportunity to grow is what Capricorn and Sagittarius people experience in their relation. They are different from each other but also admire what they miss in their personality. Sagittarius people are very adventurous and funny creatures that are very outspoken and most of the time friendly. No two are the same. One may be amusing and eccentric while another may be overly curious and serious about life. All in all they love people, life and what lies ahead. They not just take someone’s word for truth without asking a tremendous number of questions before getting to their own truth. They are protective of their independence and fill their lives with adventure, good friends and good conversation. Sagittarians are brutally honest and humbly loyal to what they feel is good. Though relationship always attracts Sagittarius people but being tied to them is something they find difficult. Like Sagittarius, Capricorns also seek out for the practical truth. They gear toward the sure thing over a risk almost every time. Their love and devotion toward the people that are closest to them is unprecedented. They are not such the social butterfly nor are their optimism levels quite so high. In fact, much of the time they tend to sit on the more pessimistic side of things. They appear to be so grounded and stubborn that others often mistake them as introverts and believe they cannot ever be swayed about anything they have decided. But deep inside Capricorns are very ambitious and attentive people who observe every step they take to reach the top of the success ladder and gain social respect and value. 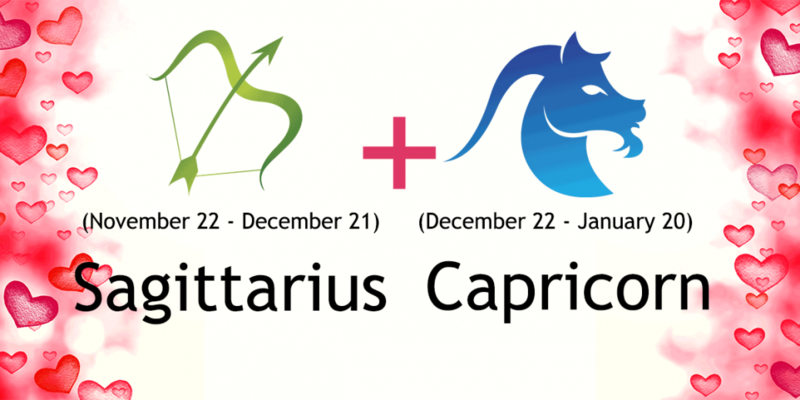 The relationship between a Sagittarius and a Capricorn is not one that comes easy. There are a lot of controversies in the way that the other one thinks and does things. Capricorns are much grounded in their ways while Sagittarius are out and about frolicking from one thing to another and having fun in life. Although they both believe in getting to the truth, Sagittarius goes out there and ask questions until they get to the core of that truth, whereas Capricorn finds what has already been tested and take that approach. While Sagittarius gets irritated at Capricorn’s quiet and serious nature, the Capricorn is equally irritated at the way Sagittarius wastes valuable time that could be better invested in something more concrete. If these two are adamant about being together, they need to cooperate more with each other and they can discover that they can learn a lot from each other. The financial situation is no different. While Capricorn finds a tried and true place to invest their money for the future, Sagittarius finds ways of spending what they can get their hands on. Since they love to travel and explore, their money is spent in pursuing these matters rather than holding it up in some dusty old bank or boring stocks and bonds. It is a very touchy subject for these two in any relationship and should be dealt with from the beginning. If they truly try, they can learn from each other in this field of their relationship as well. Sagittarius may try to see that some investing is not such a bad idea and Capricorn may finally see that perhaps having a little expensive fun is healthy for the soul. Even though the Sagittarius benefits from Capricorn’s tender nature and words of wisdom when they get down in the dumps, the overall qualities that one possesses compared to the other are not very compatible whatsoever. In any relationship they share the best ones are of friends, siblings and parents with children. Especially a Sagittarius mother is a treat to a Capricorn daughter. In other relations such as lovers, spouses, business partners and professional colleagues, one may find the other as impossible or irritating. It is usually Sagittarius who finds Capricorn impossible and Capricorn finds Sagittarius very irritating. But with gentle approach and some contribution on both the sides things can always work out well. The work Capricorn and Sagittarius need to do to hold this bond together is quite hefty because the qualities they do not like about each other outweigh the things they do like. For the most part, however, travel isn’t something they have in common. While the Sagittarius won’t think twice about packing a bag and jumping on a plane to a far off land, Capricorn shivers at the idea of having to deal with such frolicking and fanatic moving around. They also do not believe in changing their religious or philosophical views. If they were raised a certain way, then that is how it should be even though Sagittarius tries to push Capricorn to their limit in this aspect. If there is a lot of love between the two, Capricorn learns to let Sagittarius’ crude remarks fall to the wayside, however, if it becomes a constant or gets too serious they lash back with a much harsher tone almost shattering the Sagittarius. This relationship is going to take a tremendous amount of work to keep together and strengthen over the years. I am a ‘cap’, but I am a sort of subtle mix of both. I like to travel and spend money but I always think a couple of times before I take an action. I too am fun loving and quite honest face-to-face. My love being a ‘sag’. Don’t know how things will be but that won’t stop me from giving it a full try. Im a capricorn but I actually love traveling.I have along list of countries I want to go to. I have been in touch with a capricorn woman, and I have fall in love with her. I have to be honest and admit that she has changed me, for example patience it is not one of my personal qualities but with her everything seems so different. I really want this relationship to work out. Being a sagittarius and monkey it is great but I have to play my cards carefully with her. Thank you..